London - South Africa's 4x400m relay team were outclassed in the final at the London Olympic Games on Friday night. The team consisting of Shaun de Jager, Willie de Beer, LJ van Zyl and Oscar Pistorius crossed the line in last position with a season's best time of 3:03.46. Their disappointing run follows their dramatic reinstatement to run in the final after they failed to finish in their heat the night before. Ofentse Mogowane was ruled out of Friday's race after he injured his shoulder in the heats, where he tripped when Kenya's Vincent Mumo Kiilu cut in front of him. The South African stepped on his opponent's heel and both athletes fell. 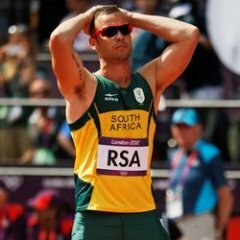 The International Association of Athletics Federations' (IAAF) Jury of Appeal agreed to advance the SA team to the final, which saw double-amputee Pistorius run in his first Olympic final. It was also a bitter-sweet occasion for De Beer, who got his first opportunity to participate at the Games, as he was the only member of the quartet yet to run. Pistorius made history last Saturday as the first amputee to compete on the track at the able-bodied Olympics. He made it through to the 400m semi-finals, but failed to advance to the final. "I was kind of distraught and unhappy yesterday, I think this is a good opportunity to thank Ofentse," Pistorius said. "He's not here with us, he's been a phenomenal athlete, he's worked for four years and he's been a big part of our team as well. "It makes me proud to be part of this team as well, over the last 24 hours we've had so many mixed emotions." After Mogowane's injury, Van Zyl - who was on his way home from the Games - had to be called in to stand-in for his injured team-mate. The Bahamas beat favourites the United States to pole position with Trinidad and Tobago taking the bronze medal.